Port Everglades and the Panama Canal Authority (ACP) have renewed their long-standing Memorandum of Understanding (MOU) to promote trade opportunities for another five years. This renewal will extend their strategic alliance to 2021. The MOU solidifies both entities' dedication to growth and best customer practices. The ACP and Port Everglades first signed an MOU in August 2009. Areas of cooperation between the ACP and Port Everglades include joint advertising programs, data interchange, and competitive market analyses of the shipping industry. 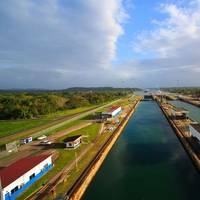 The Panama Canal Authority (ACP) was informed by its contractor Grupo Unidos por el Canal, S.A. (GUPC) on Wednesday, June 1 that the Third Set of Locks have officially passed all performance tests and are now functionally completed to allow a safe, efficient and reliable operation of the new locks in accordance with the provisions of the contract. The ACP said it will conduct a detailed review of the submitted report in order to proceed with appropriate action and respond to the contractor, symbolizing a milestone toward the inauguration of the new lane on June 26. National Assembly will question two national leaders, among them the Panama Canal Administrator. 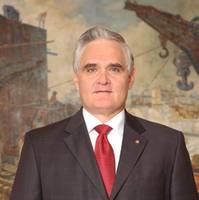 The plenary of the National Assembly has approved a proposal to call Panama Canal Administrator Jorge Luis Quijano before the body to answer questions about the waterway's finances and the progress of the expansion. The proposal was presented by a group of deputies from different parties, including Leandro Avila and Raúl Pineda of the PRD, CD Deputy Dalia Bernal and Miguel Salas of the Panameñista party. ACP touts new Toll Structure as reflecting value of route and better customer service. The Panama Canal Authority (ACP) has announced a proposal for a new toll structure, following more than a year of informal consultations with representatives from various industry segments. The ACP Board of Directors approved the proposal on December 24, 2014. Starting January 5, 2015, the ACP is inviting formal comments on the proposal. A public hearing will take place on February 27, written comments must be received by the deadline of February 9, 2015 at 4:15 p.m., local time. 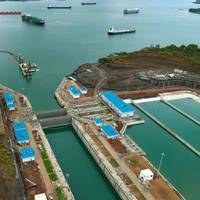 The Panama Canal Board of Directors this week formally approved the development and construction of a transshipment port in Panama’s Corozal region. 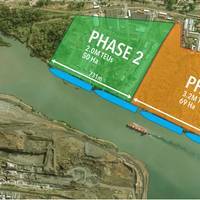 Upon completion, the port will have the capacity to handle more than five million TEUs within a 120-hectare area at the Canal’s entrance to the Pacific. The project is now awaiting the final step for approval from Panama’s National Assembly. 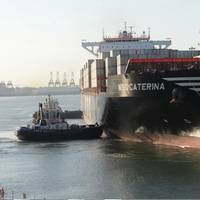 The project is another example of the Canal’s continual commitment to develop new products, enhancing customer service and furthering Panama’s position as the logistics and maritime hub of the Americas. 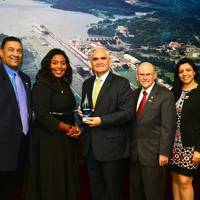 The Panama Canal Authority (ACP) received a delegation from Port Everglades led by Broward County Mayor Barbara Sharief and Deputy Port Director Glenn Wiltshire. During the meeting, the Panama Canal Administrator provided an update on the Expansion Program and its impact on U.S. East Coast ports. The Panama Canal Authority (ACP) and Port Everglades renewed their strategic alliance in 2011 with the signing of a Memorandum of Understanding (MOU). First signed in August 2009, the MOU solidifies both entities' dedication to growth and best customer practices. 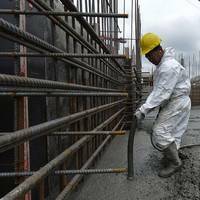 After the arrival of the second set of rolling gates, the Panama Canal Expansion keeps moving forward reaching a new milestone at the Pacific side with the pouring of more than two million cubic meters of concrete, the Panama Canal Authority (ACP) reported. "This is another milestone that shows the progress of various components of the Canal Expansion Project," said the Administrator of the ACP, Jorge Luis Quijano. The pouring mark of more than 2 million meters of concrete was reached this month in one of the monoliths that is on the west wall of the middle lock chamber. 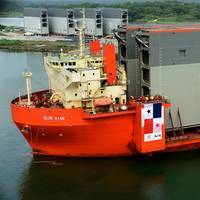 The Panama Canal Authority (ACP) informs that the second shipment of four rolling gates for the Third Set of Locks to the waterway's Atlantic side has arrived from the Port of Trieste, Italy, on board the semi-submersible vessel 'STX Sun Rise'. “This is another milestone as it completes half of the 16 gates that will be used in the new locks”, said the administrator of the Panama Canal Authority, Jorge Luis Quijano. Differing from the first shipment, these gates have two different dimensions, according to their final position in the lock chambers. Experts from the United States, Latin America and Europe will participate in the second Panama Canal International Maintenance Congress to be held on August 27 – 29, 2014, within the framework of the waterway’s centennial. The three-day event will have as main theme "Investing in Maintenance: Key to Competitiveness and Sustainability." Experts in the fields of maintenance and engineering will participate in the congress, sharing their knowledge and experiences in training for a culture of prevention. The presentations will focus on three areas: reliability and assets condition monitoring, maintenance of civil infrastructure and maintenance management. "This year, the congress has a special significance since it will be held during our centennial. Panama City, Panama, May 14, 2013 – Maersk Line CEO Søren Skou visited the Panama Expansion construction site accompanied by Panama Canal Administrator Jorge L. Quijano during his recent trip to Panama. 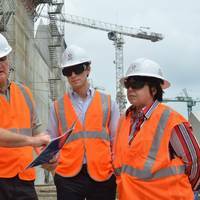 Skou and other Maersk Line executives had the opportunity to see the construction site of the new locks in the Atlantic side, which will allow the transit of Post-Panamax vessels through the Panama Canal. During the visit, Panama Canal Administrator Jorge Luis Quijano updated the delegation on the progress of the expansion program. 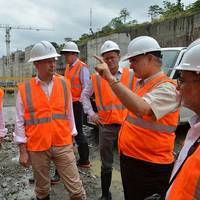 President of Inter-American Development Bank (IDB), Luis Alberto Moreno, visits the construction site of the new locks in Colon province. The new locks, situated on the Atlantic side, were visited by Moreno, accompanied by IDB delegates, who are in Panama to participate in the Fifty-Fourth Annual Meeting of the Board of Governors which takes place from March 14 to 17, 2013. During the visit, Panama Canal Administrator Jorge Luis Quijano presented an update on the progress of the Expansion Program. The Panama Canal is celebrating 13 years under Panamanian administration. During this period, the Canal has strengthened its role in international commerce as a result of investment in the modernization of its infrastructure, its expansion and an alliance with its natural surroundings. 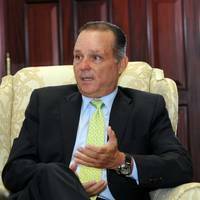 “The Panama Canal reaffirms its relevance in international commerce more than ever as a result of the decisions and actions that Panamanians have taken with regard to its management,” said Panama Canal Administrator Jorge Luis Quijano. PCA is meeting with clients, government officials, and maritime authorities from China, Japan, and South Korea to reaffirm its relationship with customers and explain the impact of the Panama Canal expansion program in Asia. China (second), Japan (fourth), and South Korea (fifth) are among the top five users of the Panama Canal. In Shanghai, the representation of the Panama Canal had contact with directors of China Shipping Container Lines (CSCL), and while in Beijing they met Captain Wei Jiafu, President of COSCO Group Company and other executives of the firm. "These direct contacts allow us to know first-hand what our customers and users of the Panama Canal think, with the goal of always providing quality service to uphold the competitiveness of the Panama route," added Alemán Zubieta.